I am presenting here the Chinese medicine view of cancer with patterns, treatment principle, herbs and herbal formulae. Very many of our patient have or have had cancer (or will have cancer) and, for this reason, I think it is extremely important to understand cancer from the point of view of Chinese medicine, even if we do not actually treat it. Moreover, even if we do not treat cancer itself, we can do our patients who have survived cancer a great service if we can develop treatment strategies to prevent recurrence. All Chinese books try to “prove” that the concept of cancer was already in the Nei Jing and other later books. The truth is that, while the ancient books have a fairly comprehensive theory of tumours, there was no concept of malignancy or of differentiation between benign and malignant tumours. There are, however, some passages that clearly indicate that, when treating tumours, the ancient doctors were well aware when a condition indicated a poor prognosis. Please note that some of the descriptions of tumours in the ancient books (as the one above) actually describe secondary infections from cancer rather than the cancer pathology itself. The tongue below shows one such case. We will very seldom see such infections because women will seek Western treatment much earlier than ancient Chinese women would have done. Moreover, the Chinese medicine theory of cancer refers only to masses and therefore does not envisage cancer without masses such as blood tumours (leukemia,myeloma). 4) Prevent recurrence after Western treatment. Chapter 55 of the Nan Jing introduces the term Ji Juindicating “masses”. Abdominal masses are called Ji Ju [积 聚]. Ji indicates actual abdominal masses whichare immovable; if there is an associated pain, its location is fixed. These masses aredue to stasis of Blood. I call them “Blood masses”. Ju indicates abdominal masses which come and go, do not have a fixed location andare movable; if there is an associated pain, it too comes and goes and changeslocation. Such masses are due to stagnation of Qi. I call them “Qi masses”. Actual abdominal lumps therefore pertain to the category of abdominal masses andspecifically Ji masses, and are due to Blood stasis. I call them “Blood masses”. Another name for abdominal masses was Zheng Jia [癥瘕], Zheng being equivalent toJi, i.e. actual, fixed masses and Jia to Ju, i.e. non-substantial masses from stagnation of Qi. Zheng Jia is normally used in referring to abdominal masses that generally occuronly in women; but they do occur in men as well, though rarely. The “Su Wen” in chapter 60 says: “Diseases of the Ren Mai…in women are masses below the waist.” In this context, the “Su Wen” uses the term Jia-Ju, i.e. non-substantial masses fromQi stagnation. Patterns:The main patterns appearing in cancer are Blood stasis, Phlegm and Toxic Heat. Blood stasis: abdominal masses, cancer of colon, carcinoma of breast, ovarian cancer. Phlegm: brain tumour, breast carcinoma, lymphoma. Toxic Heat: cancers that spread rapidly. Dampness: skin cancer (only cancer characterized by Dampness). NOTE: many types of cancer have both Blood stasis and Phlegm. Example: breast, colon, lung, prostate. That is why the combination of Blood stasis and Phlegm is particularly serious and, in a patient without cancer, it should be actively treated. The tongue is an important factor to diagnose the combination of Blood stasis and Phlegm. Cancer is seen differently than any other disease as we can always assume there is an underlying Qi Xu. I mean “Qi” in a general sense of Zheng Qi, therefore including Qi, Yang, Blood or Yin Xu. In other diseases, we never assume that there is a Qi Xu. 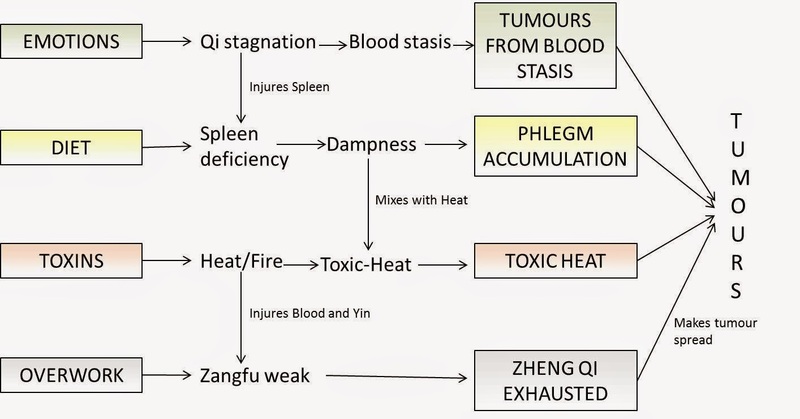 We can assume there is a situation of Qi Xu in cancer as this develops over a long period of time from accumulation of Qi, Blood, Phlegm which cannot occur without an underlying Qi Xu. Another important difference is that in cancer, the disease itself consumes Qi. Please note that, just because there is Qi Xu, it does not mean that we tonify Zheng Qi in all cases of cancer. We cannot treat cancer without a pattern differentiation as we do in any other disease. However, pattern identification alone is not enough in cancer. One reason is that we can assume there is always Zheng Qi Xu while we should never make such assumptions in other diseases. Another difference is that the choice of herbs is guided not only by pattern differentiation but also by modern research on anti-cancer effect. Another factor is surgery for cancer. After surgery for cancer, we cannot entirely diagnose from a Chinese perspective. For example, in breast lumps (benign or malignant) we diagnose from palpation (Phlegm or Blood stasis): this is obviously no longer possible after surgery. The first difference is that in cancer we can assume that there is a deficiency of Zheng Qi and therefore we must use some tonics in every case. The second important difference is that the choice of herbs is guided also by modern research. The third important difference is in the treatment principle according to stage of disease. In other diseases, generally in the beginning stage one expels pathogenic factors and in the late stage one tonifies. It is the opposite in cancer, i.e. in the beginning stage one primarily tonifies and in the late stage one primarily expels pathogenic factors. The emphasis is in the word “primarily” as one always adopts both approaches in each stage. An example of another disease might be MS. In the beginning stages, there is invasion of Dampness and the treatment principle is therefore to eliminate Dampness. If the disease progresses, there will be deficiency of Stomach and Spleen and, later, deficiency of Yin of Liver and Kidneys. In late stages therefore one must tonify Zheng Qi. In cancer, the beginning stage is characterized by deficiency of Zheng Qi (without which there would not be cancer) and one should therefore primarily tonify to prevent the cancer from growing and spreading. In late stages, the pathology of cancer is characterized by strong pathogenic factors, i.e. Blood stasis, Phlegm and Toxic Heat. I repeat, the stress is on the word “primarily” as we always adopt both treatments, i.e. tonify Zheng Qi and expel pathogenic factors but in different proportions according to stage. This is of course very obvious. We should never rely on palpation and a Chinese diagnosis in breast lumps, for example. The same applies to any other cancer. Another example would be that of prostate cancer. If a man has urinary retention, we should never treat that without a prostate biopsy to ascertain whether there is carcinoma. Western diagnosis also presents us with new opportunities that ancient Chinese doctors would not have had. For example, when cervical dysplasia is diagnosed with a Pap smear test, we can treat that (usually very successfully) before it may turn into cervical cancer. In most cases, we need to integrate our treatment with Western treatment, i.e. 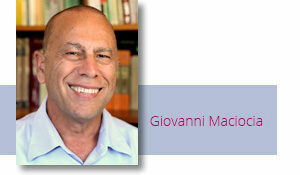 chemotherapy, radiotherapy and surgery. The only times I used only Chinese treatment was when the patient themselves were strongly against Western treatment. During chemotherapy and radiotherapy, our attention is not directed at treating the cancer but only at supporting Zheng Qi during such treatments. After chemotherapy and radiotherapy, we should make a clear diagnosis as to whether there are still strong pathogenic factors or not in order to decide whether we should primarily tonify or primarily expel pathogenic factors. Besides doing a pattern identification [Bian Zheng] we must also identify the disease [Bian Bing] as cancer manifests with a wide variety of Chinese “diseases”. Thus we must be familiar with the aetiology and pathology of the Chinese disease with which cancer manifests. Thus, although we must treat cancer differently than other diseases, we must also master the aetiology and pathology of the Chinese disease corresponding to the particular type of cancer we are treating. That will give us many indications as to treatment, choice of prescriptions and useful herbs. The following Tables illustrate the correspondence between Chinese diseases and types of cancer. It is important to have a clear idea how to approach the treatment of a patient after he or she has had Western treatment (chemotherapy, radiotherapy or surgery) as we will see very many patients after such treatment. The approach depends on the type of treatment they had. Basically, one must decide whether we should primarily tonify the Zheng Qi with the aim of preventing recurrence of the cancer or whether we should still primarily expel pathogenic factors in spite of the Western treatment received. For example, if a woman had breast cancer from Phlegm and she had a mastectomy, does it make sense to still resolve Phlegm? In some cases, yes. I choose the treatment principle a lot according to tongue and pulse. If the tongue and pulse show a Full condition, then I primarily expel pathogenic factors, but always with the addition of herbs to tonify Zheng Qi and support the immune system. Tongues indicating a primarily Full conditions: swollen, thick coating, purple, stiff. 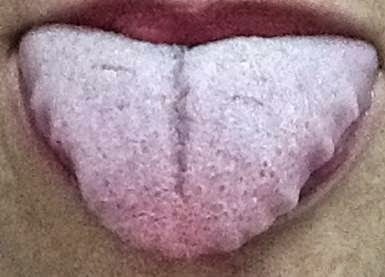 Tongues indicating a primarily Empty condition: not so purple, not swollen, thin coating or no coating. A pulse indicating a Full condition is Full, Slippery or Wiry and possibly Rapid. A pulse indicating an Empty condition is Weak, Fine or Choppy. Thus, if the tongue and pulse indicate a primarily Full condition, I treat the patient as if they still had the cancer. How to choose the herbal formula? First of all, I refer to the Chinese disease corresponding to that type of cancer in order to see if there is a Chinese formula that can be adapted to the patient. Apart from the Chinese disease, the formula must also be based on the pattern: therefore a good pattern identification is essential. 1) Make additions or subtractions according to the patient’s condition in the same way as I would for any disease. 2) Add 2-3 herbs that have a proven anti-cancer effect according to modern research. Is there herbs also treat the presenting pattern, even better. For example, Huang Yao Zi has an anti-cancer effect and resolves Phlegm: we would therefore choose that herb if there is Phlegm. 3) Add 2-3 herbs that tonify Zheng Qi and stimulate the immune system. If they also have an anti-cancer effect, all the better. During treatment with chemotherapy and radiotherapy, I do not treat the patterns, but only tonify Zheng Qi in order to support the organism during this treatment. For chemotherapy, I use the Three Treasures remedy Radio-Support and for radiotherapy Radio-Support. The treatment principle of Chemo-Support is to tonify Zheng Qi, resolve Dampness and clear Heat. For radiotherapy, I use the Three Treasures remedy Radio-Support. The treatment principle of Radio-Support is to nourish, cool and invigorate Blood. Please note that the effects of radiotherapy can be long-lasting and I therefore advocate using Radio-Support for at least 9 months after the end of the treatment.